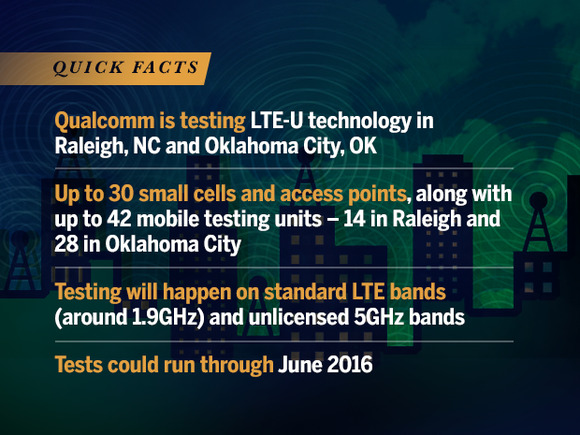 The FCC last week granted Verizon and Qualcomm permission to conduct limited tests of LTE-U technology in Raleigh, North Carolina and Oklahoma City, ahead of a planned summit meeting next week. The commission’s grant of a “special temporary authority,” or STA, will allow Qualcomm to perform performance testing in those two areas through the end of June 2016, according to the official document. Next week’s Wi-Fi Alliance summit, which is set for Wednesday in San Jose, could be an important first step towards reconciliation between LTE-U’s creators and advocates – who say that the technology will harmlessly share spectrum with existing Wi-Fi networks – and its doubters and critics, who say that LTE-U will substantially interfere with those networks. Qualcomm and the major U.S. mobile carriers have argued that LTE-U is a better neighbor to Wi-Fi than Wi-Fi is to itself, while the detractors – who include the cable industry and Google, among others – insist that independent testing shows that the opposite, in fact, is true. The Wi-Fi Alliance, which is a non-profit industry group that certifies Wi-Fi products, will bring both sides together to discuss a framework for real-world testing at next week’s event. The group promises only an “update on progress toward an industry agreed test,” but even that would be a change from the status quo, in which there are few commonly agreed facts about LTE-U’s coexistence with Wi-Fi. WiFiForward, a broad-based advocacy organization dedicated to the stewardship of Wi-Fi technology, praised the FCC for remaining involved with the ongoing LTE-U debate. “We are encouraged that the FCC still expects that Qualcomm and other LTE-U supporters work closely with the Wi-Fi community on coexistence testing in the future,” said Save our Wi-Fi campaign executive director Bill Maguire in a statement. But Ellen Satterwhite, a spokesperson for the group, said that it’s much too early in the process to know what the testing will signify. “We’re at the beginning of the beginning here,” she said. Qualcomm, for its part, pronounced itself “pleased” that the FCC had accepted its testing proposal by issuing the STA and that the Wi-Fi Alliance had agreed to back the test protocols. “Along with the other proponents of LTE-U, we have a substantial vested interest in Wi-Fi. That’s why we are collaborating with all stakeholders to ensure that LTE-U and Wi-Fi coexist successfully,” the company said through a spokesperson.